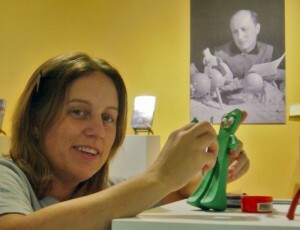 Gumby Central met with puppet maker Nicole LaPointe-McKay to get the inside scoop on making puppets and what it is like to have a career in puppetry and stop motion animation. Part Two: The Puppet Maker Career follows. Part One: Making Gumby appeared in our December 2011 blog post. GC: Thank you for taking time to continue our conversation on puppet making and animation as careers. Let’s start with the basics. What kind of education is needed to be a puppet maker? NLM: Going to college helps you to focus and push forward in the right direction. There are plenty of theater arts programs worldwide. Going to college helped me meet and team up with others, who helped me break into the industry. If you are highly disciplined and self-motivated, you may be able to learn on the job. Building your portfolio is critical as is doing volunteer projects that help get your name out. GC: In our last interview, you mentioned some of the events in your life that inspired you to become a puppet maker. Where did you study for this career? NLM: I started out as a theater major with a concentration in scenery and stagecraft at Radford University in Virginia. I found that I really enjoyed a sculpture class I took one semester too. For French class, I chose to write a paper on the French Punch and Judy puppets (Le Guinol). At the same time I wrote a report on Bunraku, (Japanese puppet theater) for a theater history class. While researching, I learned about the University of Connecticut’s Puppet Arts program. All of my research and writings on puppetry, in addition to my new found love of sculpture, pushed me in that direction. I auditioned and was accepted into the UCONN Puppet Arts Masters Program. While working on my master’s degree at UCONN, I was influenced by my study of old style Italian performance Commedia dell’arte. There is a lot of slapstick comedy and clowning performance in this art and it is actually where the “slapstick” came from. By learning to use my own body in expression, I could better understand and transfer the motions to the puppets. I also studied Chinese rod puppetry, which is a very high energy and expressive style of Chinese puppetry. There was a lot to gain in going to school for puppet arts. I got to know the history of puppetry around the world, gained experience in woodcarving, mould making and met some great people along the way. All of our classes required performances, so we not only made puppets, but we performed them. This hands-on experience was great, and I would recommend it. GC: How did you gain your first employment in puppet making? NLM: During and out of college, I joined forces with my colleagues and fellow students to do work at a few different studios, making puppets and scenery on the east and west coasts. Some of the jobs started as volunteer projects or unpaid internships and ultimately turned into paying jobs. Puppet making led to doing stop motion animation. Many jobs are obtained by word of mouth, so it’s good to maintain a strong network of colleagues. GC: How did you go from puppet making to stop motion animation? NLM: Once the puppets are made, it’s only natural to take the next step into animating them. Puppetry is “bringing an inanimate object to life.” Animation is much the same thing—you bring a drawing, painting, or puppet to life, giving them breath, a personality and movement to tell a story. I believe that it’s important to continually hone and expand my skill set. For instance, I experimented in the garage with my cousin and a friend a lot while at school to learn more about mould making and casting. We used a variety of materials to make puppets, life castings, and gigantic Halloween monster costumes. GC: Do you have any heroes or mentors who inspired you? NLM: Besides Arthur Clokey? Art was a man of few words, but when he spoke, we all listened and not just because he did the voice of Pokey and many of the narrator voice overs. He had a great sense of humor and loved word play. You can see this in many of the Gumby episodes. Jim Henson and Frank Oz were two more heroes of mine of course! All their characters have been part of my life since birth: Sesame Street, the Muppets, the Dark Crystal, Fraggle Rock and many others. There is so much life and personality in all the characters they developed and inspired. The humor appealed to me as a child and still holds my attention as an adult. Gumby is the same, especially the 1950s and 60s episodes; I loved them as a kid and still like to watch them now. There is magic in creating a character and stories that work on these various levels and age groups. GC: What is the life of stop motion animator or puppet maker like? NLM: You have to be flexible! Few studios hire for life. When one production is done, you may have to take another project in a different studio and city. Much of the work in this industry is freelance. It’s like a traveling circus. That makes it interesting—you never know what you will be doing next or where. GC: What advice would you give to those who are interested in a career in stop motion animation or puppetry? NLM: One thing that has helped me to gain employment is to be open-minded and continue to expand my skills. Having a broad skill set has opened many doors. An animator who can fix his/her own puppets, do lighting and paint sets is more marketable. Building a resume and portfolio are very important. You have to be willing to start at the bottom—cleaning up puppets, working as an intern for little or no pay, to get your foot in the door. GC: Thank you again, Nicole! Learn more about puppet making and how Gumby is made in the first segment of this interview available on our blog. See production photos from the Gumby Studios here. We caught up with Gumby puppet maker Nicole LaPointe-McKay to get the inside scoop on making puppets as a profession. Part One of our interview follows, and Part Two will appear in a future blog post, so stayed tuned; you’ll want to read the full story. GC: Welcome Nicole. Thank you for taking time to join us at Gumby World today to tell us more about yourself and your experiences as a puppet maker. NLM: I’m happy to be here. I appreciate the opportunity. GC: How did you become interested in being a puppet maker? NLM: I’ve been interested in puppets since I was a kid. I was obsessed with the Muppet Show and stop animation programs. I watched Gumby on TV with my little brother. My mother would craft puppets for me to use in plays that I made up. I put on shows with hand puppets, my favorite monkey puppet, and a few marionettes. I always volunteered to get up in front of people to perform and lead others, such as the Girl Scouts, in plays. I was a thespian in high school, and it seemed natural that I would go on to study theater in college. GC: How did you get involved with Gumby? GC: What kinds of puppets do you make? NLM: I’m trained to work with just about any material and style of puppet. In my studies I was exposed to puppets from around the world and different time periods. Some of my favorites were the Japanese bunraku, the French Guinol and the Italian Commedia dell’Arte. Currently I fashion a lot of clay puppets for stop motion. I do have some personal projects in the works that involve hand-rod, big-mouth puppets (like the Muppets-type puppets.) I’m doing some new clay animation, too. GC: How do you make a Gumby puppet? NLM: Gumby is made of mostly Van Aken clay—a secret recipe! I whip up a batch following his unique recipe, mix, and boil it down in a double boiler to a unified color and the right consistency. I prep the silicone/stone mold with a floating armature. This is Gumby’s skeleton. I then pour the mixture into the mold and let it cool. Sometimes I chill it in the fridge to speed the process. Next, I pop him out of the mold and clean him up by trimming the seams and patching the bubble marks. Gumby gets an oil massage to make him smooth. I then drop a faceplate on him to mark where the features will go. Finally, I add the delicate clay features of his face. GC: How many Gumby puppets does it take to make a Gumby TV episode? NLM: More than you would think. The number of puppets needed really depends upon the storyline and type of morphing and movement that the puppet does. When Gumby morphs and changes shape, he needs to be replaced after every few seconds of animation, because the clay loses its shape. One minute of animation can require 20 Gumbys, sometimes more. The lights can also melt the clay, requiring a change of puppets. Because we go through so many puppets, it’s critical that they are all identical and made to the same specifications. 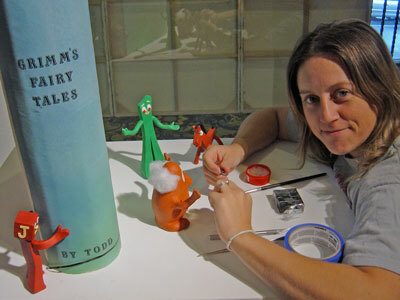 GC: You were involved in the Gumby Google doodle that appeared on October 12, 2011 to honor Art Clokey’s 90th birthday. Tell us about that. GC: What do you do for fun? NLM: I’m always brainstorming and designing puppet shows and animations based on the interests of little kids that I know. I watch a lot of cartoons with my two-year-old daughter. I love to create (working in clay, painting…) and most enjoy brainstorming creative ideas with my artsy friends. GC: What are your favorite recent animated productions? NLM: I’m into watching Timmy Time, a stop motion animation with clay, foam, and rubber puppets done by the Aardman studio in England. I like this style of animation, because there is little speaking; it’s simple and tells the story through actions. Rather than a lot of words, they use onomatopoeia. Timmy Time is a preschool of animals, which children of all ages can enjoy watching. It’s cute, funny, has bright colors and teaches a lesson. GC: What inspires you about the future? NLM: Giving back is essential. I grew up in an area that did not provide many opportunities for kids to learn the arts. I still remember a week in my fifth grade class when our teacher had us make puppets and do a book report using them. That changed my life I think. You never know how you can have a positive influence on the next generation. To do my part, I teach stop motion animation classes and workshops at summer camps for kids. Today, kids are animating with their phones and digital SLR’s. They have so many opportunities to create animations or other imaginative works. The tools are readily available. I love to help spark their imaginations. Learn more about the career of puppet making in the second segment of our interview with Nicole. Look for it in a future blog post.